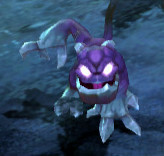 I want an imp as an Avatar pet! I've had a hard time putting down the controller while playing Torchlight lately, so I hunted down Runic Games artist Jeff Mianowski to ask him a few questions about the game. Read on to find out what he had to say! Megan: What is your current job title at Runic? Jeff: My job title is "Lead Character Artist". Megan: There are so many cool–looking little creatures in Torchlight — which was your favorite character or monster to work on? Jeff: For monsters, I would say that the two most fun were the little imp that the Alchemist can summon and the final boss of the game, I modeled and textured both of those. They were really fun for me because I hadn't been at the company long and it was a great way for me to really dig into the art style of the game. I'm pretty happy with how those two turned out. Megan: I won't spoil anything about the final boss, but I love those little imp guys! It's hard to believe something so cute was summoned from the dormant energy in corpses. So, I heard Torchlight sales hit a big milestone recently, did you do anything special to celebrate the 1 million sold mark? Runic’s dungeon-crawling debut game has recently added some buzz to your hacking and slashing. If you start a new character in the Xbox version of Torchlight today, you may notice a new spell scroll in your hero's inventory called “ilovebees”. This is a nod to the alternate reality game that was used to promote Halo 2, and was added to the game in celebration of Torchlight selling over one million units on PC, Mac, and Xbox, as Runic announced earlier today. If you haven't tried this delightfully addictive action-RPG on console yet, you can pick up Torchlight for only 800 Microsoft Points as part of the current Deal of the Week promotion on the Xbox LIVE Marketplace. This Microsoft published arcade title boasts an intuitive new UI for the Xbox 360, as well as masterfully reworked aiming and movement controls. Torchlight II technology was used for the console version to streamline the animations, add automaps, and even reduce load times. These features, along with the added immersion provided by controller rumble for events such as a low-health heartbeat and a fish tugging at your line, make the Xbox LIVE Arcade release the fullest Torchlight experience yet. The inaugural IGDA Summit is quickly approaching, along with a veritable boatload of industry luminaries. Developers will be gathering at the Fairmont Olympic Hotel in downtown Seattle, WA July 18th-19th for this valuable opportunity to learn from one another’s experiences creating successful careers, games and businesses. Networking activities will be plentiful throughout the week, and don’t forget to join us Sunday evening right before the Summit for an evening of intrigue aboard the IGDA Murder Mystery Dinner Cruise. Details and ticket information are available on the event page. The leaves have all turned, and before we are shuttled through the barrage of cold weather holidays, we should take some time to enjoy October. The fresh apple cider and Halloween spirit should both be savored, and one of the most fun ways to do this is by playing zombie games. Dead Rising was released for Xbox 360 this summer by zombie game veterans, Capcom. You play the part of Frank West, a freelance photographer with a penchant for dangerous photo opportunities. When the game sets out, you only have 72 hours to complete the main storyline. After a successful playthough of the main story is completed; the game awards you more and more time to play around in the mall and mop up any achievements you may have missed. There are many survivors trapped inside Willamette Mall, but there are far more of the non-survivor variety. 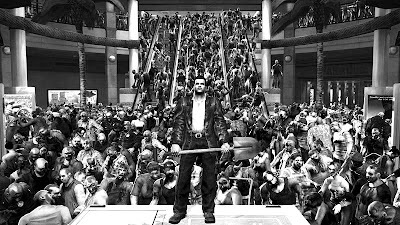 Just in case 53,594 zombies weren’t enough to keep you occupied, there are psychopaths and cultists ready to ruin your day at the mall.